Jonathan Cahn’s shemitah prophecy book predicts a financial collapse or "something" like it for America possibly in 2015 because he claims it is a Sabbath year. But is it? Does the Bible say God curses in Sabbath years? My review of Cahn’s latest book exposes the flaws in his theory, why you don’t have to worry about his predictions and what the real meaning of the shemitah is according to Scripture that he missed. The author of the best-selling The Harbinger is back with a new book once again predicting curses for “defiant” America, “maybe” in 2015. The title is quite a mouthful: The Mystery of the Shemitah: The 3,000-Year-Old Mystery That Holds the Secret of America's Future, the World's Future, and Your Future! But the new book is not presenting a new theory; it's an expansion on a chapter from The Harbinger named (you guessed it) The Mystery of the Shemitah. In case you missed it, The Harbinger was based on finding a pattern in the prophecy of Isaiah to Israel and applying that pattern to America. The idea was that God was warning America through nine harbingers about her sins including her "defiance" in rebuilding the destroyed World Trade Center. He stated that the September 11, 2001 attack on the WTC and the 2008 stock market crash were sent by God in shemitah years as part of these harbingers. Since most Christians have never heard the Hebrew word "shemitah," Cahn's title is suitably provocative and interest-grabbing. The shemitah God gave to ancient Israel applies to all nations, everyone, including you and me "from the day you were born." The shemitah becomes a year of judgment for rebellious nations. To be the first to have discovered this pattern of seven year intervals between financial downturns mentioned above. According to Cahn, the timeframe to watch is the 09/25/2014 to 09/13/2015, the next shemitah. God may bring a financial collapse, a famine, infrastructure stoppage or other "shaking" in this 2015 period because it is a shemitah year just as he did in the last two shemitahs of 2001 and 2008. In this article we'll evaluate these claims using Scripture and clear thinking or what is called common sense. Am I Attacking Jonathan Cahn? Paul, for one, would agree with what I'm trying to do in this article. When speaking of the church meeting (a microcosm of the greater global church body connected on the internet), he stated, “let two or three prophets prophesy and then let the others judge” (1Co 14:29). This is not to argue that Cahn is a prophet. Nor does he need to be one to apply this verse to his work. Cahn has put his theory out into the public arena by publishing a book and doing interviews on it. The principle from Paul's letter to Corinth is that when someone puts forth a word to edify the body, the rest of the body is called upon to judge it. We are not to blindly accept it or bite our tongue if we have nothing positive to say. We're not called to be nice; we're called to love. If someone is in error and leading others into error, the loving thing is to help them both out—lovingly. That's what I'm doing here. As proof of this, let me state something radical. I'm not anxious or upset that Cahn is teaching error. We all do, including me! As a prophecy website proprietor for almost two decades, I recognize something that few do: false prophecy theories like Cahn's are not all bad in their effects. When they catch on and go viral, they in fact can produce a notable positive effect. Some who hear them become intrigued or agitated enough to develop a personal interest in Bible prophecy that they did not have before. I've seen and heard this many times over the years. Many who read my book never would have done so had they not heard the latest (false) popular prophecy theory. For those who have known for decades about the shemitah and biblical calendar that it derives from, a title like "The Mystery of the Shemitah" comes across as sensational and not serious. For me it is about as appealing as, say, “The Mystery of the Leap Year” would be for any of us who have grown up with the Gregorian calendar. We know the origin and purpose of the leap year and would be suspicious of someone claiming that they found a secret mystery in it. Let's begin by demystifying the shemitah and making it as plain to you as a leap year. First, understand that the shemitah is properly translated into English as "Sabbath year." Ring a bell? The usage of that term probably immediately helps as many more Christians have heard of that English term than the Hebrew one. An agricultural land rest: Fields, vineyards and orchards were to be left fallow, unplanted and also unreaped for an entire year (Ex 23:10-11; Lv 25:2-7). Public Reading of the Law: The Law/Torah was to be read aloud to the public in the Sabbath year (Dt 31:9-13). This would help former debtors and slaves know the wisdom of God's instruction and perhaps avoid becoming poor, in debt or enslaved again. Year of Blessing: If Israel would follow the above instructions, a blessing of an abundance of food lasting three years would come in the sixth year, the year before the Sabbath year (Lv 25:18-22). A general blessing was promised for that and for releasing slaves and debts (Dt 15:18). Note that there is no promise or prediction of a curse in the Sabbath years in any of these passages (or any other). Cahn has not derived this idea of the Sabbath year being a curse from Scripture. He forms it by looking at some past Sabbath years where bad things happened to Israel (like 586 BC, the destruction of Jerusalem) and then concluding God picked Sabbath years specifically to do a curse (just as he did to bless them with extra food for obedience). Not a very safe approach as we shall see. Now it is true that God said in many places he would curse and eventually exile ancient Israel for disobeying the Sabbath year and any of the other commands he gave them. And it is also true that the length of Judah's 70 years of exile in Babylon was derived by God from their breaking of 70 Sabbath years. But it never says the Sabbath year is to "become a curse" year or a year to wipe out your "entire nation" if you failed to wipe out debt accounts and release slaves! This approach of taking something obscure in Scripture and going way beyond what it says into the realm of assertion and speculation is a repeat of what Cahn did in The Harbinger. In that case, he brought out an unknown OT prophecy from Isaiah 9:10 about ancient Israel as something new and mysteriously applicable to America too (!). In this case he takes the Sabbath year blessing for ancient Israel, obscures it with its Hebrew name and turns it into a curse for modern nations. Cahn's 7 Year Economic Cycle Discovery? In his interview with Sid Roth, Cahn claims to have discovered a pattern of "economies rising and falling" in Sabbath years. He gives 1973, 1980, 1987, 2001 and 2008 as examples of this important discovery. Sid Roth makes an interesting comment about how Cahn's discovery would have been useful in his former career as a "stockbroker on Wall Street. If I had only understood these biblical principles, if I was a mutual fund manager I could be the top mutual fund in the world." With all the real economists and financial industry analyst watching and studying the economy, why has no one but Cahn found this amazing seven year pattern of downturns? With all the stockbrokers and speculators invested in the market having a financial incentive to find any real pattern to give them an edge, wouldn't you think at least they would have found the pattern Cahn sees long before he did? Now, Sid's answer to his own question was that they can't see it because they don't know the "biblical principles" Cahn is teaching. However, this idea of a curse on a nation in a Sabbath year is not a biblical principle as we covered above. And really that's only a (poor) explanation for why these downturns happen in Sabbath years. One does not need to know why to recognize a real pattern as simple as downturns every seventh year. One only needs to be looking at the data, something that all the financial scientists do and a lot more than Cahn. The real answer to why no economist or any other financial authority has identified this pattern and leveraged it is because real scientists and people with real money on the table are more disciplined than Cahn in making assertions like he has. They are aware of their own cognitive biases of self-deception to see patterns that are not there. They are also held accountable to prove any such claims with real data. They cannot just cherry-pick a few Sabbath years out of hundreds of possible Sabbath years and claim a pattern. They would be ripped apart by their peers (or lose their shirt investing money based on such a theory). In other words, the pattern Cahn claims to have found is simply not there. Cahn is a victim of his own cognitive biases, such as confirmation bias  (seeing what you want to see and ignoring evidence to the contrary) and cherry-picking data. And unlike an economist in the scientific community, he is not held accountable for his spurious assertions by his non-scientist peers or by his non-scientist Christian readers. They simply do not have the training to spot weak assertions like Cahn puts in his books. Another area where Cahn is cherry-picking the data that suits his theory (confirmation bias) is in his determination of the Sabbath years as well as their starting month. What someone listening to his interviews would not know is that the years he lists as Sabbath years are not necessarily Sabbath years. They are not facts, they are opinions. There is no consensus on when the actual Sabbath year cycle is. The cycle that Cahn goes by is the more popular opinion of the cycle in Judaism, but it is not the only one. Other rabbis believe in other years. Similarly, he's following the popular Jewish calendar that puts the start of the Jewish year in the fall, on the first day of the seventh month. The Jews call this day Rosh HaShanah or "head of the year." However the Bible does not, it only calls it Day of Trumpets. It further says that the start of the Hebrew year is in the spring when the barley is aviv or just maturing (Ex 12:2). That would be Nissan 1 or the first day of the first month on the calendar of Judaism. There are many other divergences between the actual prophetic calendar of the Bible and the religious calendar of Judaism. In practice, this results in the prophetic days and years arriving on different dates and time-frames than what the Jewish calendar says. Of course, God is not going to fulfill the OT on the wrong days and years that the Jewish calendar says but on the actual ones (Mt 5:17-19). Unfortunately, most prophecy authors like Jonathan Cahn, Mark Biltz or John Hagee seem to be unaware of the problems with the Jewish calendar and blindly follow this counterfeit calendar. This throws all the dates of their predictions they associate with biblical holidays into question just as much as the predictions themselves are in question due to lack of direct biblical support. Which Years Are Really Sabbath Years? The Sabbath year (like all biblical years) begins in the spring (March/April) not the fall (September/October). This means a shemitah definitely did not start September, 2014 nor will it end September 2015 as Cahn claims. The Sabbath year is actually not until 2016. That would be spring, 2016, not fall. This is not based on rabbi's opinions or religious tradition of Judaism but on the best historical data. You can read a detailed study on the Sabbath year cycle  if you are interested in it. Nevertheless, I would not expect anything to happen in 2016 for the same reasons stated above for 2015. There is no Scripture describing curses in Sabbath years nor any real pattern in history of financial downturn in Sabbath years. What is the prophetic meaning of the Sabbath year? One thing's for certain, it's not what Cahn's books say it is. Thankfully, God is not so capricious that he doles out punishments on nations based on a rest year command he never made known to them. You don't have to trust my opinion on this assertion anymore than you must trust Cahn's on his; you can prove this yourself (if you care to) by reading your Bible. You will not find any verses to support Cahn's "mystery." However, this is not to say there is not a hidden meaning to the Sabbath year to be discovered if you discard Cahn's counterfeit mystery and look in the Bible. After all, the Bible teaches that all the Torah and Prophets (OT) must be fulfilled (Mt 5:17-19). This means it all works as prophecy on the primary or secondary level of interpretation. In most cases its prophetic meaning is not obvious and could be classified as a mystery. Jesus called these things "secrets of the kingdom of heaven" (Mt 13:11). I believe that the prophetic import of the Sabbath year is explained in the "70 weeks prophecy" of Daniel 9:24-27. The prophecy describes 70 prophetic "weeks" of years, or 70 heptads (groups of sevens). Of these 70 heptads, 69 heptads (or 7 + 62) had to do with events that would happen over the 483 years from "the decree" to rebuild Jerusalem. “7 weeks”/ 49 years, Jerusalem was rebuilt (Dan 9:25 HCSB). In 69 weeks/ 483 years after the decree (or "62 weeks" more), the “Messiah the prince” would appear (Dan 9:25 HCSB). Jesus was in fact baptized by John the Baptist in that exact year to begin his ministry as the Messiah. “after the 62/69 weeks, he shall be cut off, but not for himself" (Dan 9:26). This word "after" speaking of the 69th week instead of saying "in the 70th week" indicates there is a gap between the 69th and 70th weeks . That leaves the "one week" (Dan 9:27) or 70th week/heptad or final seven years at the end of which Jesus returns to "bring the rebellion to an end...bring in everlasting righteousness" (Dan 9:24) by ending the Great Tribulation and defeating the Antichrist and False Prophet. The “Real” Mystery of the Shemitah? What does this have to do with Sabbath years? Sabbath years are the final year of a heptad or block of seven years that Daniel refers to. When Jesus came as Messiah to fulfill Daniel's 69th week, it was the Sabbath year of 28-29AD. Jesus himself declared this soon after starting his ministry in the synagogue of Nazareth by quoting Isaiah 61:1 and half of Isaiah 61:2 about the "favorable year of the LORD," of "good news for the poor" and "liberty to the captives and freedom to the prisoners" (Luke 4:17-21). As we saw above, the favorable "year" for the poor and liberty for others is the Sabbath year. If Jesus' first coming at the end of the 69th week was a Sabbath year, then his second coming at the end of the 70th week will also be a Sabbath year. In other words, the real "mystery of the shemitah" is that Jesus must return in a Sabbath year and will not return in any of the other six out of seven years on the calendar. As you can imagine, this is hugely helpful for us to know in planning our lives and in discerning date predictions for end time events, not limited to Jesus' coming, but to all events of the final heptad. When Jesus does come back in that final heptad, he will fulfill Isaiah 61:2 a second time, this time not just the first half of the verse but the whole verse. That includes the part about "the day of God's vengeance" (Isaiah 61:2b HCSB) again in a "favorable year of the LORD" (Sabbath year) (Isaiah 61:2a HCSB). This refers to the Day of the LORD in the Sabbath year at the end of the 70th week, the day of Armageddon pictured in Revelation 19 and 20:1-3. For more on proof on this prophetic meaning of the Sabbath years and for a chart of the possible years Jesus can return based on this, see my book Know the Future. 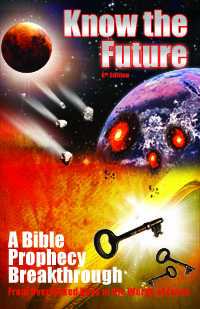 If you liked this article, you will LOVE my book, Know the Future , a comprehensive, literal explanation of end time prophecy read by over 25,000 people since 2005. Copyright © 2017 Escape All These Things (Luke 21:36). All rights reserved.